Feel free…fly like a bird!!! Paragliding is a fascinating experience you will never forget; a different way to escape from the ordinary. The intense contradiction of emotions and the different perspectives create a unique environment. Coming directly in contact with nature and the wind gives you a sense of absolute calm and freedom. If you so desire, you may raise the excitement a notch by asking the pilot to perform mild, completely controlled acrobatics that will take your adrenaline to a whole new level. Tandem flights do not require prior skills or knowledge. If you want to fly, we can make it happen for you. 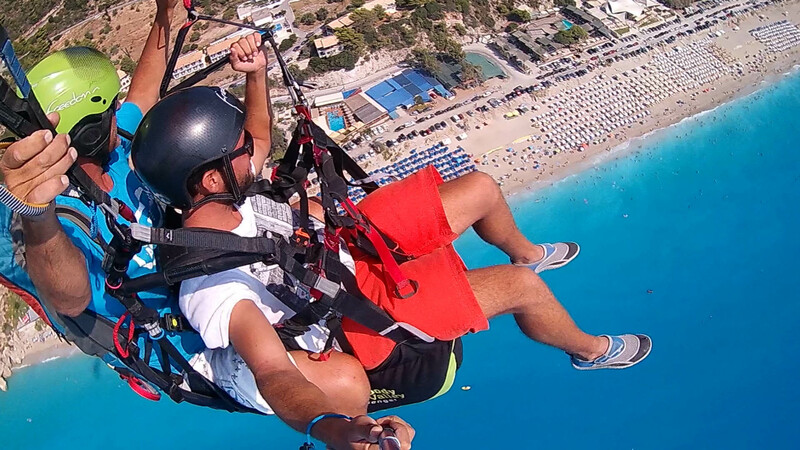 All our experienced pilots hold valid Hellenic Aeronautical and Airsports Federation licenses and they will give you the experience of a lifetime. FREEDOM school is in its third decade of operation, providing quality services, including tandem flights. Safety being an absolute priority, every passenger leaves with a huge smile on their face! Men and women, 18-60 years old, weighing less than 105 kg. Every day of the week, all year long. The best time is from the start of March to the end of November. Due to weather conditions, the best time for the 60-minute flight is from the start of May to the end of September. At Mt. Kithairon in Plataies (Boeotia) and Mt. Kandili in Megara. Prevailing winds are always the determining factor. Both sites are less than one hour away from the centre of Athens. Prices include all the equipment and local transports. Keep the memory of your flight on video and in photos. You may use your own camera, free of charge. If you don’t have a camera and you want us to take care of it, with an additional charge of €10 you will get to watch the video with your friends and relive the experience! Looking for a gift somewhat out of the ordinary? 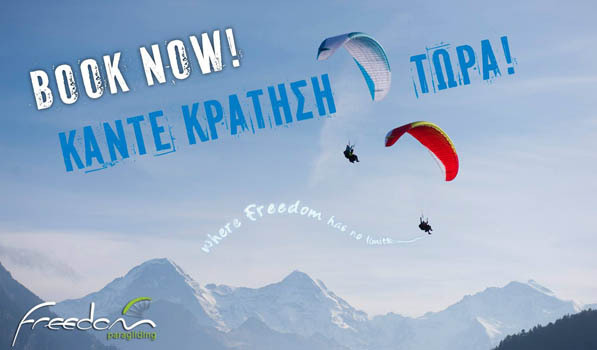 Offer the gift of Freedom Paragliding, as flying is the experience of a lifetime! 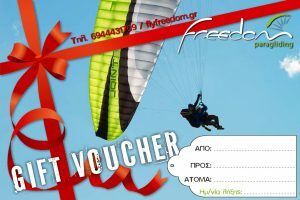 The Gift Voucher is valid for six months. Send us an email (info@flyfreedom.gr) or give us a calll (+302262 097100 – +306944 431709). Simple flights can be booked up to two days in advance. For a 60-minute flight you need to book five days in advance. 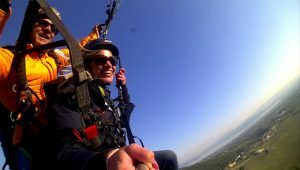 The pilots who perform tandem flights are paragliding trainers with at least 25 years of experience (also as members of the Greek national team).